Often considered controversial in the past, Weil (The Natural Mind; Health and Healing, etc.) 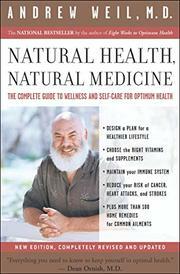 here offers generally sensible and accepted advice, in practical detail, on healthful life-style and self-care. His chapters on diet, drinking water, and air and breathing give more attention to pollutants than do most such manuals, but that's to his credit. And otherwise, though he comes on at the beginning as something of a maverick, his recommendations on diet, exercise, and controlling risk factors are quite in tune with the prevailing current. He properly dismisses a lot of the claims of health-food-store products and other alternative remedies as hucksterism or mistaken non-sense. His major departure from mainstream manuals is in the final chapter, on the "herbal medicine chest," which offers interesting suggestions, some for practices common in China, for treating bothersome conditions. An alphabetical discussion of natural treatments for conditions from acne and allergy to vaginal yeast infections also offers some uncommon treatments but no wild claims or dangerous denials of the role of conventional medicine. A highly readable guide, with a healthy and attractive premise, this is likely to be much consulted.